Ebenezer Scrooge was visited by a series of ghosts in Charles Dickens' 1843 classic A Christmas Carol. Why poke fun at Charles Dickens? 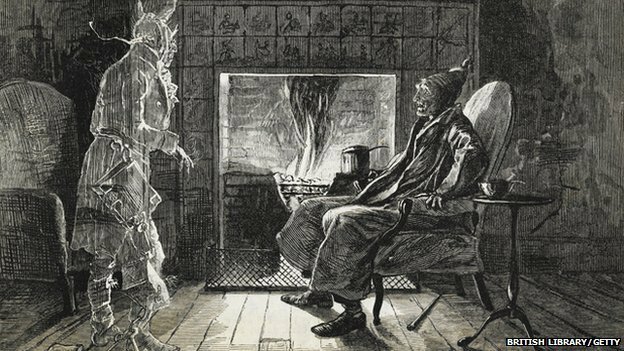 It is no coincidence that Charles Dickens' A Christmas Carol features more ghosts than carols, or that the 1963 Andy Williams song It's The Most Wonderful Time of the Year promises "scary ghost stories". Christmas was once the time for sharing tales of the spooks we now usually associate with Halloween. Our traditional festive celebrations owe much to the Victorians' plundering of pagan symbolism - whether the still-fertile appearance of evergreens and holly, the bearded god Odin's habit of climbing down chimneys, or spectres at the fireside. As the Winter Solstice approached and daylight died away, the ancients thought that the barrier between the living and the dead became slender, so supernatural tales abounded. The practice continued on television in the 1970s with the BBC's A Ghost Story for Christmas series, which was revived in 2005. So why have we not lost our appetite for these supernatural tales at Christmas? "Perhaps it is something of a reaction to the otherwise jolly time of year," says actor and writer Mark Gatiss. "Something feels right about pushing things off kilter, beside a warm fire, for the safe thrill of having your flesh creep. "It's a healthy scare, that Jamesian 'pleasing terror', a catharsis. It's just as important as having a good laugh." This year it is Gatiss's turn to bring a spine-chilling tale to the small screen on Christmas Day. 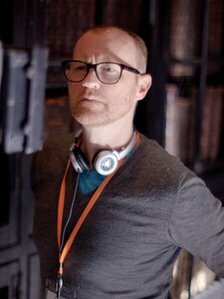 Celebrated for his work on Sherlock and Doctor Who, Gatiss makes his directorial debut with The Tractate Middoth - an adaptation of the M.R. James tale first published in 1911. He also presents a documentary on James himself - a Cambridge scholar who entertained his friends each Christmas Eve with horror stories and a glass of sherry. Born Montague Rhodes James in 1862, he was the son of a clergyman who went from Eton to study at classics at Cambridge. He became a noted medieval scholar before returning to Eton to serve as Provost. He was a devout Anglican, and a profoundly conservative individual, much as one might expect of a man who went from parsonage to school, university then back to school. Nevertheless, this sheltered life had wrought a terrible imagination. James referred to the "pleasing terror" that tales of horror can induce, but his monsters are not modern lovelorn vampires or werewolves with bills to pay. They are ghastly, half-seen but fully-realised works of evil. His characters, often Oxbridge dons or vicars who are a little too pleased with themselves, insist on touching when all available intelligence screams "do not touch" and digging where folklore indicates "dig not here". Adapted from a story by MR James by director Jonathan Miller for the BBC. A smug academic on a beach and finds an ancient whistle and recklessly blows on it, stirring more than the seagulls. Adapted by Nigel Kneale from the book by Susan Hill, a young lawyer attends the funeral of an elderly widow who lived alone in a house in the marshes and begins to see evidence of a ghost. Lawrence Gordon Clark directed Charles Dickens's terrifying fable about a traveller and a railway worker for the BBC's Christmas slot. It was apparently inspired by the 1861 Clayton Tunnel train crash. ITV's supernatural series starring David McCallum and Joanna Lumley told a ghost tale that lives with anyone who saw it. A WW2 soldier appears on a railway platform, but are there other forces at work? "If your mansion house needs haunting just call Rentaghost". Jester Timothy Claypole and Victorian gent Hubert Davenport provide scaring services to the public in the much-loved children's series. They are punished horribly for their pride, the stories satirising the world that James inhabited. "James wanted his creatures to be ghastly," explains Gatiss. "I think he'd have had no truck with sad, longing ghosts yet to be released to heaven. "There is something implacably horrible about his monsters, with their black matted hair, teeth and nails. "The recent trend for more human vampires is an interesting one, but for me it's exciting enough that they just want to drink your blood and watch you die for the fun of it." The solidly ravening ghoul at the centre of the Tractate Middoth is 'typical James', and Gatiss can only speculate as to what experiences might have fired the writer's dark imaginings. "It seems that very deep within him was a horror of intimacy, in fact he is described in the documentary as a 'non-practising homosexual'." Gatiss's own theory is that he saw something he wasn't supposed to see. "There is a short story A Vignette, somewhat autobiographical, set in a country rectory very similar to the one he grew up in and it's really ever so odd. "He speaks of being a small child and seeing this malevolent form, not a ghost, but pink, solid, hot. What on earth was he talking about? What did he witness?" The avowed master of the genre, M.R. James's tales continue to be adapted and re-adapted for television. It is also becoming a festive tradition for Gatiss, who wrote the supernatural drama Crooked House for Christmas in 2008. He says the Christmas ghost story is "something that I would be more than happy to keep writing until the day I die". The Tractate Middoth is on BBC Two at 21:30GMT on Christmas day. M.R James Ghost Writer follows on BBC Two at 22:05GMT on Christmas day.